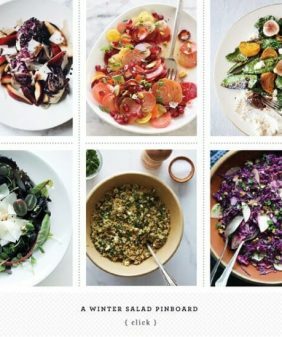 Win a $50 Whole Foods gift card. 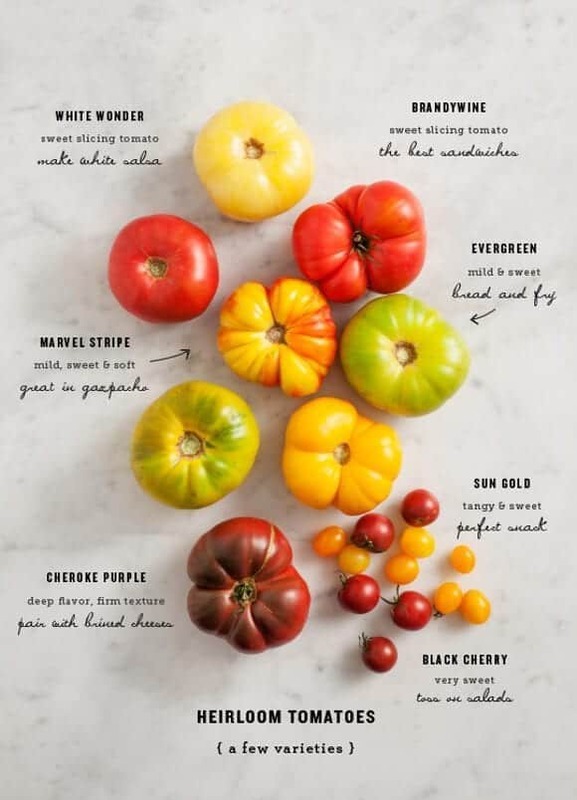 Just leave a comment below telling me about your favorite way to eat heirloom tomatoes! This post is in partnership with Whole Foods Market. Thank you for supporting the sponsors that support Love & Lemons. Giveaway ends 8/22/13. Open to US residents only. Sliced, with the best burrata, and drizzled with olive oil, fresh lemon juice, and a pinch of salt and pepper! I love sliced tomato with some s & p, a drizzle of very good evoo and a drizzle of balsalic served with burrata, Sometimes just a slice of really good bread with some homemade mayo and thick slices of tomato and a couple of pieces of bacon. Now I have to go make lunch! My favorite way to serve is to cut them up on a platter with various colors and sizes. Add some avocado and red onion and drizzle with balsamic and olive oil. Then rub minced herbs (oregano, basil, thyme) into Ricotta Salata and sprinkle over the top. YUM! I love them straight out of the garden! Wash them with the hose and take a nice bite like an apple. Otherwise just about any form will do but I have my eye on a few Tomato Garlic Tarts that I would like to try – hmmm goat cheese, mozzarella, feta or ricotta? Pappa al pomodoro. Nothing is better than this simple soup of crushed heirloom tomatoes, poured over bits of toasted, salvaged stale bread. A few fresh herbs and a drizzle of herbaceous extra virgin olive oil…la cucina povera perfetta! Simply – with fresh basil, slices of good mozzarella and drizzled with a balsamic reduction. Sprinkle of sea salt and pepper for a little kick! Sliced with a little salt and pepper! MMHHMMM! No need to dress up a good tomato. I love fresh tomatoes! Romesco sauce is my current addiction-blending up tomatoes with fresh basil, almonds, and lots of garlic with a few spices and tossing with brown rice pasta…it’s exquisite! Tomatoes are my favorite food ever. Heirlooms are like the cherry on top. It may sounds boring but my most favorite way to eat them is as a snack. No salt, no dressing, just as they are. Of course salads, in pasta, and sandwiches are lovely as well. But nothing beats eating them as they are. Is it a cop-out if my response is simply thick slices with a sprinkling of salt and pepper? ha, not a cop-out! Simple is sometimes best! I have to say that I agree with Jenn. The best way to enjoy a good ripe tomato is simply seasoned. Dressing it up with some fresh herbs and good, mild cheese (so as not to overpower the flavor of a prime tomato) hits the spot, as well. Gotta love tomato season! my favorite way to use heirlooms? super simple–the perfect caprese sandwich, complete with crusty, toasty bread, homemade pesto, fresh basil leaves from the garden and thick slices of buffalo mozzarella. yum! I can’t do anything more to heirlooms than to just top with S&P, olive oil and basil chiffonade. But if it’s around, I would slather it with burrata cheese and call it a day with a glass of chard. Gotta chime in and say that sliced, with sea salt and fresh black pepper is the absolute best way to go. Although it’s a tradition in my family to have bacon & tomato sandwiches in the summer – just white bread, mayo, thick bacon and sliced tomato. No lettuce for us Arkansans! I love showcasing the Heirloom beauties and subtle flavor differences between them by serving them simply. I always try to recreate my most precious food memories of my time in Italy by slicing them and serving them drizzled with the best olive oil, sea salt, fragrant basil, and fresh mozzarella. An accompaniment of rustic crusty bread, roasted red peppers, olives, and capers is always welcomed. You can’t beat them with salt, pepper and some good olive oil! Lovely photos! Paella with tomatoes from Mark Bittman’s recipe. The addition of smoked paprika makes it absolutely divine!! Heirloom tomatoes remind me so much of my mom… coming home in the summer and seeing a plate of blood red tomatoes, thickly sliced, stacked and salted. I still prefer them this way… so simple. The hearty pinch of salt just lets the tomato shine all on its own while it’s in season. with just a sprinkle of salt! Simply. Just sliced with a slight sprinkle of salt…..
Is it weird if I just bite into ’em like an apple? I also love them on top of garlic crostini with goat cheese and a drizzle of lemon infused olive oil! Sliced on sourdough toast with just a little bit of Kewpie mayo and pinch salt and pepper. Simple and delicious! Definitely with fresh moz, s+p, basil, and good olive oil. In a simple caprese salad: Thick slices of tomato, slice of fresh mozzarella cheese, fresh basil, and balsamic vinegar drizzled lightly over the top. I’m pretty simple. I love heirloom tomatoes with fresh mozz, basil, a bit of salt and olive oil. Yum! honestly, in that heirloom tomato & avocado salad recipe you posted last week. ha, good answer 🙂 glad you liked it! I love tomato, fresh mozzarella and basil pesto as a combo for pizza, salad or sandwich! I threw some in my food processor the other day to make a spicy sauce for some pasta, such rich flavors! Who needs the hollandaise with flavors that vibrant?! 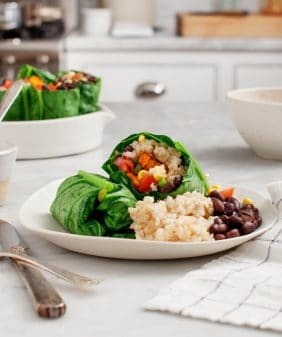 stacked inside a veggie wrap with hummus! on toasted whole wheat sourdough bread with a bit of mustard and a bit of basil or argula, a fried egg and some fresh cracked s&p directly on the tomato and on the egg. yum. I like them in a sandwich, plain or in a pasta sauce. With a dash of salt and, if I’m feeling luxurious, a drizzle of really nice olive oil. I’ve never had heirloom tomatoes, unfortunately. But I love fresh (warm!) tomatoes plain w/ a little salt. Or w/ some fresh mozz, of course. thin slices on homemade bread w/ basil, olive oil and a sprinkle of garlic salt. Rough chopped with sliced lemon cucumbers and red onion. Let marinate with minced garlic, salt, pepper, & white wine vinegar. Such a yummy side! I love a brandywine tomato sliced about 1/2 inch thick, sprinkled with sea salt and fresh ground white pepper layered on slices of fresh herb-onion bread, so the juices from the tomatoes soak into the bread. The list of ways I don’t enjoy heirloom tomatoes would be shorter, e.g. as an ice cream topper! Seriously though, I have to say that slow cooking them down on the stove to make my homemade pizza/pasta sauce not only tastes divine but makes my kitchen smell like a little piece of heaven, for hours… And the Sun Golds have a home in a dish on my kitchen counter. Perfect snack, indeed! My favorite way to eat heirloom tomatoes is just sliced and sprinkled with salt. There’s nothing finer! although I can’t say I mind a good caprese salad or eight as well. 🙂 Thanks for the giveaway opportunity! I enjoy heirloom tomatoes thickly sliced with room-temperature fresh mozzarella and a sprinkling of sea salt! As simply as possible- just a sprinkle of sea salt to bring out the delicious flavor and natural juices. I love them sliced with just a bit of sea salt! For something a (tiny) bit more involved, I made a caprese panzanella with heirloom tomatoes last week that was pretty incredible. I think I ate my first heirloom tomato in Paris, so my favorite way to eat them would have to be the first way I discovered how to eat them: with a little comte cheese on a fresh baguette! Bruschetta is a guilty pleasure…especially when heirloom tomatoes are used! Sliced with buffalo mozzarella, avacado and red onion, then drizzled with olive oil and a bit a red wine vinegar, fleur de sel and freshly ground pepper. After we’re tired of that we also make bread salads ’til we’re stuffed. I think heirloom tomatoes shine the most with just a drizzle of olive oil, some fresh cracked pepper, and some fresh-from-the-garden basil on top! I also love using them as a homemade pizza topping with some mozzarella. In a salad with fresh corn and avocado! Sliced with fresh mozzarella cheese! There’s a great pasta salad recipe that I love with avocado, corn, and heirloom tomatoes! Or I also love Choosing Raw’s recipe for pancakes with a side of a mango salsa that includes these tomatoes as well. Love em with salt and pepper, and avocado and onion. Delish! I love them sliced with a little olive oil, basil, and ground pepper! Simple is sometimes best! I love them in a quick and simple bruschetta – a little garlic, oil, balsamic and spices. Slice a nice crusty baguette, brush with oil and pop in broiler for a few. Yum! you can’t go wrong with a simple caprese salad! or just sliced with fresh cracked pepper + salt. Slice tomatoes (for cherry tomatoes) or cut in largish chunks (for large tomatoes) and toss with generous amounts of minced garlic and fruity olive oil. Season with salt and pepper and let sit at room temp for a couple of hours. Cook bowtie pasta (or some other appealing shape) until al dente, toss with a little olive oil, and mix with the tomatoes, lots of torn basil leaves, and crumbled feta cheese. Simple and scrumptious. I love to eat them in a new heirloom tomato tart recipe I recently found. I’m dreading the day tomato season is over! I have never been much of a fan of raw tomatoes, but heirlooms have changed my opinion! To really savor the tomato flavor, I like them sliced with salt! picking hot sunken cherry tomatoes straight off the sheet pan after being oven-roasted with olive oil, salt and a little maple syrup. Anything tomato and avocado. Right now my obsession is a piece of toasted Ezekiel bread topped with a generous amount of avocado and tomato slices and a dash of pepper. So simple. So good. There is no bad way to eat heirloom tomatoes, but my favorite in in a BLT. Dense artisan bread sliced thin, lightly toasted, good smoky bacon, lots of crisp lettuce, and big thick slices of tomato. It wall definitely drip down your arm, but that’s OK.
on toast with avocado and salt and pepper! Usually with salt & pepper, olive oil and basil. But I just had an heirloom tomato salad with a warm bacon dressing that was delicious and I have to recreate. Heirlooms with burrata, some olive oil and a loaf of french bread is the best summer dinner on a hot night! the best way is to enjoy them sliced with a little bit of salt! I love to eat them by themselves (like apples!) or with eggs and toast. YUM! If I can get enough so that I don’t feel I am missing out on them raw (and i eat them the same way everyone does with salt or plain) — I roast them with some olive oil, s&p, small drizzle of balsamic vinegar and sliced sweet onion until brown and caramelized. Then dump it all in a food processor to make a chunky sauce that can go on anything from pasta to potatoes to the base for a different kind of shakshuka. i think it’s ok to treat heirlooms this way- they make everything better and richer! I actually prefer them totally plain and unadorned — I can enjoy the flavor and texture best that way. But I won’t turn down a BLT or caprese salad! lightly breaded in panko bread crumbs, some italian seasoning and pan fried in EVOO – then topped on thick, toasted slices of focaccia bread. I think the best summer heirloom tomatoes need only be sliced, served with a drizzle of olive oil and a sprinkle of freshly ground pepper and some Maldon salt flakes. I feel like tomatoes just need a pinch of salt to be the perfect snack. But most often I have been tossing them with basil, grilled vegetables, and some cooled pasta for an easy summer dinner. 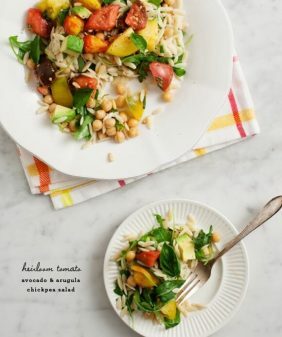 I’ve never had an heirloom tomato, but the recipes I’ve seen look so good and I’m thinking I need to try one soon! in a gigantic salad with basil and roasted veggies! Heirloom tomato panzanella is hard to beat! There are few things more delicious than a perfectly ripe heirloom tomato. I’m a purist. I love a good heirloom tomato caprese style with sliced and layered with fresh mozzarella, basil, with a little balsamic vinegar, extra virgin olive oil, salt and pepper. Yum! a tomato & cheddar sandwhich. my mom used to make these for us when we were younger, and they are still my favorite. sliced tomatoes, served on toast with salt, pepper, and sharp cheddar cheese. yum! salt! And I don’t have to feel guilty either. My doctor told me to eat more salt for my low blood pressure! Sliced with fresh goat mozzarella, basil, salt and pepper, with a generous drizzle of aged balsamic! With a glass of sangria in my hand. Summer! My absolute favorite way to eat heirloom tomatoes is on good sourdough bread with a schmear of goat cheese, a drizzle of olive oil, and a crank of fresh pepper and salt. Better yet if the tomato in question is pilfered fresh from my parent’s extensive tomato garden. I love them in bruschetta: My favorite way is an olive oil-toasted baguette rubbed with a garlic clove, topped with sliced heirloom tomatoes and fresh mozzarella or burrata, fresh basil from the garden, drizzled with a balsamic reduction and finished with a light sprinkling of Maldon sea salt. I like to roast the tomatoes for soup with eggplant, chickpeas, and curry powder. A restaurant here in DC used to make the most amazing deconstructed panzanella salad with heirloom tomatoes. That’s saying a lot since I actually hate tomatoes. i will use them in a really rustic tart with lots of cheese. With basil, olive oil, balsamic, kosher salt and black pepper! Unadorned, except for a bit of sea salt after sliced. Divine! tossed in a super assertive vinaigrette with blanched green beans, avocado, and fresh mozzarella! Tomatoes are my favorite food… in the summer I go crazy and try to put them in literally everything! However, my favorite way to eat them is with a pour of really good olive oil, kosher salt, fresh ground pepper and herbs from my garden. Tomato Carpaccio! Thinly sliced tomatoes with minced basil and a balsamic reduction…so fresh and amazing! i like to eat them sliced with salt and pepper and a fried egg; a simple delicious breakfast. I like to eat them right off the vine from my garden. Or roasted in the oven with a sprinkle of salt and pepper and a drizzle of olive oil. Love them tossed with pasta, evoo, basil, and mozzarella! My favorite way to eat heirlooms is to make a wedge salad out of them. Just need some EVOO, lemon juice, and some fresh oregano. It’s the best! I love fresh heirloom tomatoes in Vietnamese crab noodle soup! 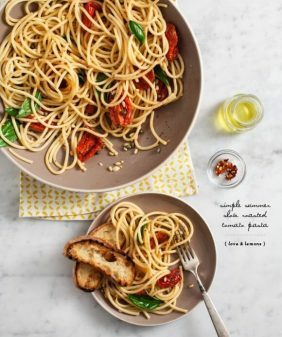 In a fresh, no-cook tomato sauce over linguine! I feel so spoiled any time I have the little baby heirlooms to just pop in my mouth! Absolutely my favorite, although I’ll eat them any way I can! Straight off of the vine, maybe salt and a little pepper! In a panini with some fresh mozzarella cheese and basil from my (very small) garden. Yum! I enjoy mixing sungold and brandywines with fresh mozzarella. Beautiful presentation and taste! I’ve been so enamored with heirlooms lately that I’ve been pairing them with everything — my absolute favorites are either plain and simply sliced with a sprinkle of sea salt, in a hearty unblended gazpacho jam-packed with veggies, or in my mom’s classic southern tomato pie recipe — the mayo’s totally worth it in this recipe! On bruschetta. thanks — your pics are lovely! I like using heirloom tomatoes in a salad along with other tasty summer produce, corn and basil. I just made them in a rustic ratatouille yesterday with eggplant, zucchini, onion, peppers and a bit of balsamic/garlic/basil/rosemary/thyme. It was fantastic! I absolutely LOVE making my husband’s favorite pasta sauce using fresh heirloom tomatoes and basil. cherry heirlooms are my favorite! i just eat them like cherrys 🙂 without the pits! My husband hates tomatoes but I love them, so have to sneak them into my lunches. Love sliced or diced with balsamic, olive oil, basil, pepper and pearl-sized fresh mozzarella! Cut up with a little salt on them. Best yet right off the vine, just pop them in my mouth…..delicious! With slices of fresh mozzarella cheese, basil, and balsamic vinegar! I recently made a tomato-ricotta tart with some beautiful heirloom tomatoes. I added some lemon basil to complement the fresh tomatoes—pretty tasty! I am a HUGE fan of heirloom tomatoes. They make a perfect addition to any pasta dish, and also mixed up in a fresh salad. My favorite way to eat them is as a caprese salad with fresh basil and mozzarella. Or in a salad like the tomato and avocado one you posted. I love using them in salads – they add color and you barely need much salad dressing. Just some olive and vinegar for this girl! Not super exciting, but delicious: I like eating a plate of sliced tomatoes sprinkled with sea salt! Divine! I like to slice them and sprinkle them with a bit of Li Hing powder (plum powder). It’s so delicious! All the classic tomato dishes are better with superior tasting tomatoes. If I have fresh ripe heirlooms I love eating them for breakfast sprinkled with fleur de sel and paired with a side of soft scrambled eggs. If it’s the end of the season and I have unripe green tomatoes I love roasting them whole (if they’re small or quartered when big) with olive oil and making a sort of rustic tomato chutney. I use it as a topping for many things but I love it on top a batch of homemade baked beans. My favorite way to eat an heirloom tomato is definitely with avocado and goat cheese and fresh bread! I’d have to say it’s best to let the tomato speak for itself! A little salt and pepper; a simple caprese salad with some fine buffalo mozzarella or burrata; or in a grilled cheese sandwich with chewy, crusty country/soda bread baked with kalamata olives and guyere and fontina. I love heirloom tomatoes sprinkled with sea salt and layered atop crusty French bread smeared with goat cheese and a little honey. Yum! I remember eating sun-warm tomatoes from my grandparents’ backyard garden as a child, and the way we ate them still remains one of my favorites: toasted whole wheat bread, with a swipe of mayo (one of the only places I like it! ), thick tomato slices sprinkled with salt and pepper, crisp lettuce, and another slice of bread. The juice from those tomatoes would run down my hands and forearms, and it was heaven. I like them roasted in some olive oil. I love eating them on top of smashed avocado toast. Or in caprese salad with mozzarella, basil and a touch of salt, pepper and olive oil! Delicious rustic bread toasted with a simple layer of hummus and the tomatoes sliced as least as thick as the bread – if not thicker! – i live in san francisco; our tomato summers feel like winter! a medley of large heirlooms, oven roasted in a soup with pureed roasted peppers, caramelized shallot, a dash of pomegrante molasses and topped with a garlic tapenade is the best way to warm up on a foggy summer’s night! My neighbor brings me about 5 different varieties every week. Right now I’m loving baking them and adding a little olive oil, fresh basil, and Parmesan. I have to say gazpacho, even though I miss out on all the pretty colors once it is blended up. So yummy though! I love to toast some artisan bread, spread on some vegan pesto (pesto without the parmesan), and add the tomatoes, some avocado, spinach, salt and pepper! I like to make tomato and basil grilled cheese sandwiches, among other things! my favorite is sliced with fresh mozzarella and basil with balsamic. yum.. I made a roasted tomato soup recently…new favorite way to eat garden tomatoes! I love to slice an heirloom tomato, spread it on a plate, give it a drizzle with olive oil and balsamic and a sprinkle of fresh basil and sea salt. Yum! We have a “family recipe” called “tomatoes on a plate”–slice them up, throw a little fresh basil on top, maybe some dried oregano, salt, pepper, balsamic, and olive oil. I guess you could say it’s a Caprese without the cheese? Anyway, it’s an oldie but goodie. i would love to have an heirloom bruschetta with fresh french bread, lovely olive oil, and a bit of fresh basil sprinkled on top. yum! keep it simple to bring out the natural flavor of the tomatoes. coarse salt, pepper, good olive oil, some burrata and torn basil. DELICIOUS! Sliced, with a little sprinkling of salt – That’s all I need! My favorite way to eat perfect tomatoes is on top of really good toast, either with a dab of mayo plus salt and pepper, or with basil and balsamic. Pick them and eat immediately while they’re still warm from the sun 🙂 Cut them up with mozzarella, basil, & balsamic. Perfect! I can’t say I have 1 favorite way to eat tomatoes. We love them and eat quite a few. Tonight I tossed tomatoes, avocado, roasted butternut squash, fresh basil & lentils together with EVOO, lemon juice & a pinch of smoked salt and it was delicious! Tomatoes also great with cucumbers and sprinkled with a little lime juice & Tajin on top. With basil, feta, and olive oil!! In my hand, just like an apple, except that I get to eat the whole thing (except the stem). If I’m feeling nutty, I will sprinkle a teensy bit of salt on each bite. Heirloom tomatoes are better than candy. Super simple (and not at all boring): sliced, with reduced balsamic, basil, feta, and some toasty nuts. Its like summer on a plate! Roasted Heirloom tomato sauce! Slow roast (3-4 hours) the tomatoes, red peppers, onions, and garlic drizzled with evoo, S&P. While warm, blend them into the best sauce ever. No other tomato can compare in taste with a roasted heirloom! Last time I did this I used the sauce in eggplant parm. Our guests never knew it was gluten & dairy free…it was declared the best they’d ever had. I just like eating heirloom tomatoes by themselves. They’re so pretty I don’t want to mess with them! Olive oil, sea salt, cracked black pepper, and a teeny drop of balsamic vinegar. Yum. mmmm i am, of course, always on the evoo-drizzly/mozzarella bandwagon, but they’re fantastic in a Mediterranean bread salad too: toasted baguette, cucumbers, kalamata olives, red onion and heirlooms all mixed up in some lemony-olive oil. YES! I love making a tomato galette with ricotta – the multiple colors of heirloom tomatoes make it even more beautiful! My favorite is to keep it simple to really keep the flavor of the tomato as the main event. I take a nice crusty slice of toasted bread, slather on half of an avocado, thinly sliced red tomato, and a nice thick slice of tomato on top. I top with some salt, pepper, and olive oil. yum! I love using these tomatoes on a pizza! my favorite way is simply any way there is a seasoned and summer ripened tomato on a fork, even better if it grew in my backyard. In a couscous salad, with fresh corn salsa, feta cheese, garden cucumbers, and fresh oregano and parsley with an Italian or Greek dressing. With fresh ground pepper and some balsamic vinegar. Yum. I love to eat them simply! The best is a salad, uncooked, with mozzarella, watermelon, basil, and a little balsamic! I love to eat them simply sliced, with a bit of sea salt sprinkled atop, a few basil leaves nestled between, & a drizzle of balsamic glaze. In a salad with grilled corn and fresh basil. Tastes like summer! Bruschetta is the best way to enjoy heirlooms; not only does it fast fresh and delicious it’s beautiful. I love a classic caprese salad. My fav way to eat heirloom tomatoes is to keep is simple: thinly sliced tomato, basil, a hunk of burrata and topped with sea salt and balsamic! My father-in-law grows heirloom tomatoes, and nothing beats a freshly picked heirloom tomato eaten like an apple or quartered with salt sprinkled on top. I love them sliced up as a topping on tomato pie! It’s great. Just make some pizza dough, tomato sauce, and lay the slices down on that. Flash bake on a pizza stone in a charcoal grill when the coals are at their hottest! You really can’t go wrong with a BLT. sliced with salt, olive oil, and reduced balsamic vinegar! I’ve been eating mine in sandwiches with pesto, bliss! I like to eat them raw, maybe as an Insalata Caprese – tomatoes, mozzarella, basil, salt & pepper and good quality extra-virgin olive oil & some great balsamic vinegar. So good! Sliced with a dash or warm morning sun! With salt, hunched over the sink. I love to eat them sliced, with basil and nothing else!!! Yum!!! 2) baby heirlooms halved and tossed with raw garlic, olive oil, fresh basil, red pepper flakes, and marinated for 4 hours. then eat over pasta! My favorite way to eat heirloom tomatoes is simple – a little bit of good olive oil and sea salt. straight out of the garden with a touch of salt, on a piece of crunchy, toasted whole grain bread! wow, to come up with only one way to eat a tomato. honestly, i love a slice or two on a piece of bread with olive oil, balsamic vinegar, salt and pepper. Sliced, tossed with olive oil, salt & pepper, then roasted in the oven. I know everyone’s saying it, but it’s so tried-and-true: with buffalo mozzarella, a drizzle of balsamic and olive oil, and fresh basil. I love them on a grilled cheese with sharp cheddar. The. Best. That first shot is to die for! So gorgeous! I love tomatoes, I am not sure if there is a way that I don’t like them. If I had to pick a favorite, a caprese sandwich or salad drizzled with balsamic. I just love a good, old-fashioned tomato sandwich. Salt, Pepper and Mayo on bread. A favorite of mine since I was a child! I love the look of these tomatoes. I had no idea the names were so awesome, thanks for sharing. I’m a big fan of sliced heirloom tomatoes with a drizzle of good olive oil and balsamic vinegar. Any way that highlights their beautiful color! I would say on top of a frittata would have to be my number one, though… with shredded basil and plenty of black pepper! I love using them for tomato and basil bruschettas. Not only they look very pretty but they are delicious. 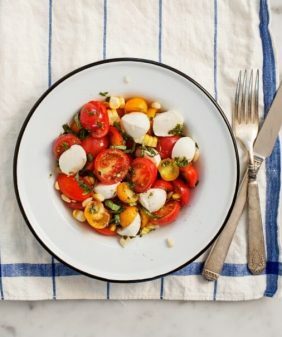 I can’t get enough of tomato/basil/corn salad with balsamic and olive oil….adding a grilled nectarine has also taken it to a whole new level! thinly sliced with a little salt and pepper. Just pure! Last summer, my brother in law, Jamie, made us this really yummy salad. Its a mexican take on the caprese salad using heirloom tomato and avocado slices, drizzles of olive oil and cilantro leaves scattered around. It’s absolutely delicious! I think we ate it every week after our trip last summer. It’s on my menu for this week, too! I like to make an amped-up pico de gallo with heirloom tomatoes, onion, cilantro, jalapeno and lime juice, plus raw corn kernels and grated zucchini. i use it on tacos, salads, frittatas, brown rice, you name it. it has a really beautiful color! If the tomatoes are fresh out of the garden I love to eat them plain or at the most a little bit of good salt. Most recently, I’ve really enjoyed them in a simple panzanella! Fresh mozzarella cubed, s&p, olive oil, homemade croutons, cucumbers, and maybe some balsamic vinegar and herbs. YUMM! plain…with a pinch of salt and pepper. Perfection. I roast mine with hot peppers, throw whole into a blender with salt, pepper, and raw garlic cloves. Roasted salsa recipe taught to me by a former Mexican chef, as translated through her daughter. Sliced thinly with mozz and basil on good foccacia. I could eat caprese salad every day for every meal, as long as I can make it with fresh heirloom tomatoes, basil, mozzarella, EVOO, and aged balsamic vinegar… nothing else… no salt, no pepper. Just pure ingredients. Delish. I love grilled cheese and tomato sandwiches. ALSO, a lovely slice of tomato, a piece of cheese, cracked black pepper, all on a good chunk of bread. I love adding heirloom tomatoes to summer salads and frittatas! 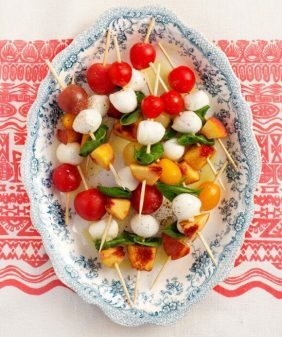 A simple caprese salad is the best way to enjoy the delicious flavors of heirloom tomatoes! I did an heirloom tomato salad vinaigrette which I topped with a scoop of homemade tomato sherbet that was garnished with basil chiffonade! Delicious AND beautiful. I like to eat them plain–rinse one off, add some salt, and eat it like you would an apple. They are so delicious as is, why do anything to them? Little s&p, evoo, and basil. That’s all one needs in life. Maybe add a porch swing for ambiance. I love eating them sliced with salt, sugar and lots of black pepper! I like to take a drive to the Italian store and buy freshly made loaves of Italian bread, still warm, and then run back home! Take a plate, knife, good salt, olive oil and run to the garden with the warm bread, pick the ripest tomatoes. Then have a feast with fresh basil, the warm bread, and warm tomatoes dripping with juice drizzled with the fresh olive oil under the late afternoon dappled sun. Yum. That is summer. Supersized bruschetta! None of this teeny, cracker-sized pieces you get as an appetizer in restaurants. I’m talking about big thick slices of herby Italian bread slightly toasted so its crisp outside and soft once your teeth sink in that have been dolloped with a healthy portion of bright, colorful heriloom tomatoes that have been tossed with olive oil, salt, garlic and basilbasilbasil. A sprinkle of really good pecorino cheese on top and its summer eating heaven! In a caprese salad along side aglio e olio pasta and grilled bread- yum! I love heirloom tomatoes! I like them with fresh cheese, a little bit of olive oil and balsamic and just a sprinkle of salt! Sliced with a touch of salt. I’ve been loving them on open-faced sandwiches, thinly sliced with a generous dusting of S&P, a handful of arugula, and maybe a little grated Parmesan Reggiano if I’m feeling fancy. Slathered in homemade hummus. Mmmm. Thanks so much for the giveaway! The colors of heirloom tomatoes are so beautiful, so I just like to cut them up and eat them fresh. Or make ratatouille with them! Love the colors! I think beautiful summer tomatoes are best one of two ways: eaten plain as a snack or made into a delicious gazpacho. Sliced with a touch of sea salt, pepper, goats cheese and crackers -heaven on a plate. As a bruschetta, drizzled in sweet aged balsamic with fresh basil herbs and a sprinkle of sea salt. Heaven. I love heirlooms in a salad with peaches, feta, olive oil and fresh herbs. It’s got that sweet-savory thing going on, and it’s so summery! It goes well with pretty much anything that has been grilled. Mmmmmm yes. thinly sliced with fresh mozzarella cheese and a little olive oil! I’m definitely of the mind that everything is better with cheese. You can’t beat walking outside to pick your own heirlooms from your garden, then drizzling extra virgin olive oil and coarsely ground salt over the slices. It tastes like summer! I dream of going home to my parents’ farm so I can do just that! I prefer cooked tomatoes to raw, so anything that cooks them first. 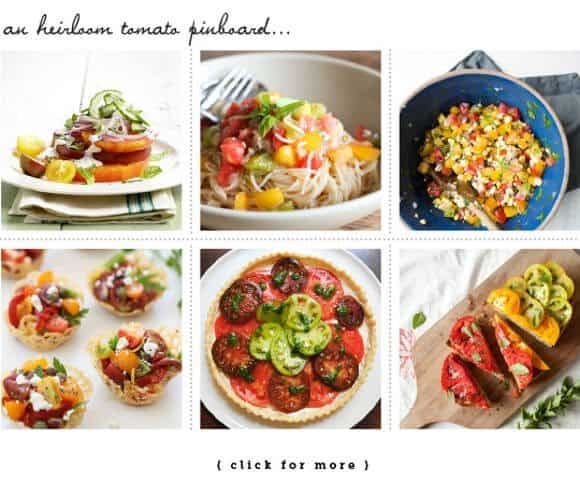 I’ve been seeing some heirloom tomato tarts that look really interesting! Simply — with a bit of olive oil and some salt. Yum! I like to keep it simple! Sliced with salt and pepper and a drizzle of good olive oil. a drizzle of olive oil, a pinch of salt and pepper, and maybe some nice mozzarella on the side. summer! Just simply caprese style – with mozzarella, basil, balsamic vinegar and good quality olive oil – delicious!! as plain as possible but sometimes on a summer pizza with corn and basil. The way my Dad taught me: thickly sliced over fresh bread with mayo, salt and pepper. Best summer meal ever. I love heirloom tomatoes with salt, pepper and some yummy mayo sandwiched in French bread. i love an heirloom tomato sliced with some good evoo, salt, pepper & fresh basil..so amazing! good oil really brings out an heirloom’s natural freshness & sweetness. i love them in a good panzanella salad! I eat sun golds constantly since that is what we have planted. Lately I have been loving white balsamic and pesto on any and all heirlooms! Sliced with salt and pepper. Sliced, with burrata, basil leaves, salt & pepper & balsamic vinegar reduction drizzled over the top! Heavenly!! oh boy, who could pick a favorite way? i worship the tomato. roasted, fried, grilled or sauteed. i guess, like most, my favorite method is also the easiest. a perfect garden-picked tomato, sliced, with salt. tastes like summer. With a little bit of ricotta, basil, olive oil, pepper, and some chunky sea salt! Oh my, so delicious. My favorite way to eat heirloom tomatoes is on warm toast rubbed with garlic and topped with avocado and burrata. Yum! On a Vegetarian pizza with Mozzarella pearls! Sliced with salt, plain and simple. I love them on pizza! fresh salsa. or just a bit of sea salt! I love thick slices of tomato on top of garlic bread sprinkled with olive oil and feta cheese. I went to Laguna Beach in socal the other day and they had heirloom tomato flavored gelato. How funny! Roasted if the weather is cool, but at this point in August…….sliced, a dash of salt, pepper and balsamic….all wrapped up in a lettuce leaf with a slice of fresh avocado! perfection! In my family, we eat them with every single meal. While I do love them with everything, nothing but nothing beats the perfect deliciousness of a simple tomato sandwich. with fresh mozzarella and a bit of balsamic.